Webster G. Tarpley writes: After about two and a half years during which the danger of war between the United States and Iran was at a relatively low level, this threat is now rapidly increasing. A pattern of political and diplomatic events, military deployments, and media chatter now indicates that Anglo-American ruling circles, acting through the troubled Obama administration, are currently gearing up for a campaign of bombing against Iran, combined with special forces incursions designed to stir up rebellions among the non-Persian nationalities of the Islamic Republic. Naturally, the probability of a new fake Gulf of Tonkin incident or false flag terror attack staged by the Anglo-American war party and attributed to Iran or its proxies is also growing rapidly. The moment in the recent past when the US came closest to attacking Iran was August-September 2007, at about the time of the major Israeli bombing raid on Syria.1 This was the phase during which the Cheney faction in effect hijacked a fully loaded B-52 bomber equipped with six nuclear-armed cruise missiles, and attempted to take it to the Middle East outside of the command and control of the Pentagon, presumably to be used in a colossal provocation designed by the private rogue network for which Cheney was the visible face. A few days before the B-52 escaped control of legally constituted US authorities, a group of antiwar activists issued The Kennebunkport Warning of August 24-25, 2007, which had been drafted by the present writer.2 It was very significant that US institutional forces acted at that time to prevent the rogue B-52 from proceeding on its way towards the Middle East. The refusal to let the rogue B-52 take off reflected a growing consensus in the US military-intelligence community and the ruling elite in general that the Bush-Cheney-neocon policy of direct military aggression towards all comers had become counterproductive and very dangerous, running the risk of a terminal case of imperial overstretch. A prominent spokesman for the growing disaffection with the neocons was Zbigniew Brzezinski, who had been a national security director in the Carter administration. Brzezinski argued that no more direct military attacks by the United States should be made for the time being, and that US policy should rather focus on playing off other states against each other, while the US remained somewhat aloof. Brzezinski’s model was always his own successful playing of the Soviet Union against Afghanistan in 1979, leading to the collapse of the Soviet empire a decade later. A centerpiece of Brzezinski’s argument was evidently the claim that color revolutions on the model of Ukraine 2004 were much a better tool than the costly and dangerous US bombing and US invasion always championed by the monomaniacal neocons. There was clearly an implication that Brzezinski could deliver a color revolution in Iran, as he had done in Ukraine. Brzezinski formulated his critique of the neocon methods of aggression and imperialistic geopolitics in his testimony before the Senate Foreign Relations Committee in February 2007, going so far as to point out the likely scenario of a false flag event or Gulf of Tonkin incident designed to embroil the United States in direct military hostilities with Iran. The heart of Brzezinski’s analysis was this: ‘If the United States continues to be bogged down in a protracted bloody involvement in Iraq, the final destination on this downhill track is likely to be a head-on conflict with Iran and with much of the world of Islam at large. A plausible scenario for a military collision with Iran involves Iraqi failure to meet the benchmarks; followed by accusations of Iranian responsibility for the failure; then by some provocation in Iraq or a terrorist act in the U.S. blamed on Iran; culminating in a “defensive” U.S. military action against Iran that plunges a lonely America into a spreading and deepening quagmire eventually ranging across Iraq, Iran, Afghanistan, and Pakistan.’ 3 Today we could add Lebanon and Syria to that list, plus perhaps Yemen, Somalia, Sudan, and some others in central Asia. I. The US sponsored Green Movement in Iran has now demonstrably failed in its project of overthrowing the Achmadinejad government. Back in 2006-2007, the Brzezinski-Nye-Trilateral “soft power” or “smart power” group attacked the stupidity of the neocon plan for a direct US military attack on Iran by pointing out the opportunities for staging a color revolution in Iran, just as the Brzezinski faction had successfully staged the Orange Revolution to install NATO puppets in Ukraine. Why attack Iran directly, argued Brzezinski and his friends, when a US puppet regime in Teheran could be used against Russia and China in much the same way these same people had played Afghanistan against the Soviet Union, with catastrophic results of the latter. The apex of these subversion efforts came in June 2009, with the so-called Twitter Revolution, which was celebrated with hysterical gloating in the Anglo-American media. The Mousavi-Rafsanjani faction left no doubt about its CIA and MI-6 parentage with its signature chant of “Death to Russia, Death to China.” The illusion of an easy coup in Iran has died hard in Washington and London. But by June 2010, the impotence of the Green forces in Iran had become evident. Hillary Clinton is even complaining that Achmadinejad now represents a military-backed government which has marginalized the mullahs, whom the US has demonized in public but privately relied on to prevent the economic modernization of Iran. This gives rise to the tendency to fall back on the previous neocon plan for some combination of direct military attack by Israel and the United States, combined with escalated subversion efforts among the Baluchis, Azeris, Arabs, Turkmen, and Kurds of Iran. II. During the time that the neocons were attempting to launch aggression against Iran, that task was rendered much more difficult by pervasive uncertainty about the possible reaction of Russia. One of the targets of any bombing campaign against Iran would necessarily be the Bushehr nuclear reactor, being built by Russian technicians. Neocon war planners had to worry about events like the visit to Tehran of Russian President Vladimir Putin on October 16, 2007. During the Putin era, Russian media and figures like General Leonid Ivashov took the lead in calling attention to suddenly increases in US-UK war preparations, as in the case of Operation Byte, the attack on Iran proposed for Good Friday, April 6, 2007.4 While it was thought very unlikely that Russia would risk general war as a result of an attack on Iran, there remained nevertheless the question as to what Russia actually would do. This dangerous uncertainty was a very serious obstacle for the pro-war agitation by the neocons. In this way, Putin was able to make a decisive contribution to the maintenance of world peace during the years after 9/11. As of mid-2010, it would appear that the foreign policy of Russian President Medvedev is momentarily evolving away from the fierce independence and Russian nationalism championed by Putin, and is placing more value on projects of cooperation with the NATO countries, sometimes obtained by unilateral concessions to the US. Part of this can be ascribed to the increasing influence of the free market ideologue Anatoly Chubais, the architect of the nomenklatura privatization of Soviet state property during the 1990s, whose concept of the modernization of the Russian economy depends very heavily on information technology, in which he portrays the United States as being in the lead. Newsweek has reported the approval of a new foreign policy outline drafted by the Russian foreign ministry which has allegedly gained provisional approval by President Medvedev. This document is entitled “Program for the Effective Exploitation on A Systemic Basis of Foreign Policy Factors for the Purposes of the Long-Term Development of the Russian Federation.” 5 The main immediate effect of the reported new Russian policy is the apparent willingness of the Kremlin to make important foreign policy concessions to the United States with very minimal returns. This in turn means that key unknowns surrounding a US attack on Iran have become less of a concern for the resurgent neocon war faction in Washington. This adds up to a situation in which an attack on Iran is now more likely. III. It is a grave error to imagine that normal relations with the Anglo-American financiers can be obtained in the current world depression through conciliatory behavior. The US-UK are experiencing cataclysmic instability in the form of a financial breakdown crisis, and this crisis impels these powers towards irrational, adventuristic, and aggressive behavior. A key lesson of the 1930s is that, when imperialist financier elites are faced by a disintegration of their fictitious speculative bubbles, they often respond with strategic flights forward of the most lunatic sort. In the wake of the 2007-2008 disintegration of the Anglo-American banking system, the New York and London elites have shown signs of going collectively bonkers, although these clinical tendencies have been primarily expressed in the area of their reactionary domestic socioeconomic policies. The specific form assumed by this tendency after the second half of 2008 involves the severe weakening of the US dollar as the world reserve currency by the creation of a $24 trillion credit line by the Federal Reserve, US Treasury, and FDIC for the purpose of bailing out the Wall Street zombie banks. This tidal wave of dollars led to a severe weakening of the US greenback on international markets during most of the second half of 2009. In late 2009 and early 2010 a group of Anglo-American hedge funds around Soros, Paulson, David Einhorn, and others launched a speculative attack against the government bonds of Greece, Spain, and Portugal, with the goal of using a crisis in the southern tier of the euro to bring on a panic flight of hot money out of the euro, thus collapsing that currency to Third World levels. Partly because of the countermeasures instituted by the German government, including the banning of naked credit default swaps on Euroland bonds and naked shorts of German stocks, and partly thanks to direct support from China, the planned Anglo-American blitzkrieg against the euro has now bogged down after eight months of effort, with the euro currently oscillating at a price of about $1.25 – $1.30. This means that, unless the city of London and Wall Street can come up with a new plan, the forces of world economic depression represented by $1.5 quadrillion of bankrupt and kited derivatives may now find a new victim, most likely in the form of either the British pound or the US dollar. 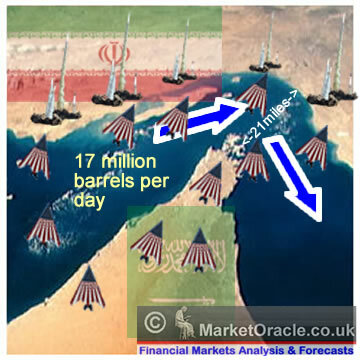 The immediate threat of a pound or dollar currency collapse is leading the ruling financier factions to reconsider a very dangerous flight forward in the form of an attack on Iran, precisely because such an aggression would likely lead to a blocking of the Straits of Hormuz or in any case to a serious disruption of one third of the world’s tanker traffic. Following the tested model of the Kippur war/oil boycott of October 1973, the US-UK financiers would bid up the price of oil to $500 or $1000 per barrel, thus creating enough demand for dollars to soak up much of the dollar overhang and prop up the greenback, at least for a time. With many reports that the United Arab Emirates and Saudi Arabia are ready to support the US aggression, great importance must be attached to the current struggle over the future shape of the government of Iraq. Here The secular Shiite Allawi is a US puppet, while his rival Maliki prefers Iran. Sadr and his Mahdi army, closely linked to Iran, represent a key stumbling block for US intentions. The US requires an Iraqi puppet state which will pursue at least a pro-US neutrality in case of war, and above all prevent Iranian special forces or guerrillas from cutting the long US supply line alone Route Tampa from Kuwait City. This is why the question of the Iraqi government was so important that Vice President Biden had to make a special trip to Iraq in the vain hope of quickly setting up a suitable puppet regime there. If the Iraq army turns against US, the situation of US forces could become extraordinarily critical. The Neocons Promise A Cakewalk — Again! In the inimitable style of neocon Kenneth Adelman, who notoriously promised a cakewalk in Iraq the last time we went down this road, Gerecht impatiently dismisses a series of arguments against such a fateful act of incalculable folly, and does not miss the opportunity to settle accounts with Brzezinski, whose alternative model of imperialist management is now losing support within the ruling elite. Gerecht writes: ‘… concerns about an Israeli bombing are no more persuasive. Hezbollah would undoubtedly unleash its missiles on Israel after a preventive strike…. Hundreds of Israelis could die from Hezbollah’s new and improved store of missiles. Israel might have to invade Lebanon again, which would cost more lives and certainly upset the “international community.”…. The Obama administration might fume, but it is hard to imagine the president, given what he has said about the unacceptability of Iranian nukes, scolding Jerusalem long. He might personally agree with his one-time counsel, Jimmy Carter’s national security adviser Zbigniew Brzezinski, that Israel has become a pariah state, but politically this won’t fly.’ 13 Three years ago, Brzezinski had the upper hand and the neocons were in disarray, but now the tables have been turned to a significant extent. There is nothing to worry about, Gerecht assures us, since the Iranians are a paper tiger and the results will be a cakewalk: ‘American fear of Iranian capabilities in Iraq and Afghanistan has been exaggerated. The Americans are leaving Iraq; within a year, most of our troops are due to be gone….’ 14 Back in 2002-2003, the neocon line was that Saddam Hussein was so powerful that he had to be attacked. This time around, their field is reversed, and the main argument is that the Iranians need to be attacked because they are a pushover: ‘If the Iranians tried their mightiest, they could give us only a small headache compared with the migraine we’ve already got courtesy of the Pakistanis, who are intimately tied to Afghanistan’s Taliban. And the Israelis know the U.S. Navy has no fear of Tehran’s closing the Strait of Hormuz. If Khamenei has a death-wish, he’ll let the Revolutionary Guards mine the strait, the entrance to the Persian Gulf: It might be the only thing that would push President Obama to strike Iran militarily. Such an escalation could quickly leave Khamenei with no navy, air force, and army. The Israelis have to be praying that the supreme leader will be this addle-headed.’ 15 The tried and true ‘cakewalk’ argument is neither the first nor the last notorious neocon trick which is being brought back these days. But what about the awesome threat of Iranian state-sponsored terrorism, the danger which these same neocons have been incessantly harping on for the past decade? No problem, says Gerecht. All we would need to do at that point is to issue a bloodcurdling thermonuclear ultimatum to Iran about incinerating that country with nuclear missiles, perhaps killing tens of millions of Iranians. As a matter of fact, Gerecht suggests, the US had better start issuing this sort of threat right now, without any further dithering: ‘It is entirely possible that Khamenei would use terrorism against the United States after an Israeli strike. That is one of the supreme leader’s preferred methods of state action, which is why he should not be permitted a nuclear weapon. The correct response for the United States is to credibly threaten vengeance. President Obama might be obliged to make such a threat immediately after an Israeli surprise attack; whether the Iranians would believe it, given America’s record, is more difficult to assess.’ 16 Note carefully that these statements amounts to the public advocacy of aggressive war, a behavior which may run afoul of the Nuremberg precedents of 1945. One of the main policy goals of the Brzezinski faction in the United States has always been to maneuver Russia into a position of hostility against Iran. The hope has always been to foment conflicts between these two Caspian powers. Unfortunately, the policy of attempting to placate the United States on certain issues pursued by President Medvedev has now created a Moscow-Tehran relationship in which elements of acrimony coexist with gestures of cooperation. On June 20, Medvedev had expressed concern about ‘U.S. secret intelligence data that Iran has enough enriched uranium for construction of two nuclear bombs. “As for this information, it needs to be verified but in any case such information always worries. Today the international society does not acknowledge the Iranian nuclear program as transparent. If the information from the American secret services is confirmed it would make the situation more tense and I do not exclude that this issue would require extra consideration,” Medvedev said at a news conference after the G8 and G20 summits in Canada.’ 23 US intelligence regarding Iran is notoriously unreliable, and distorted by political agendas inside the US intelligence community. It is even possible that some of the material which Medvedev was shown during his time in North America came from the alleged defector Shahram Amiri, whose credibility is gravely in question. In response to Medvedev’s allegations about an Iranian nuclear weapons program, leaders in Teheran responded with vigorous denials. On July 13, RIA Novosti reported that ‘Iranian officials on Tuesday angrily dismissed Russian President Dmitry Medvedev’s remarks that Tehran was on the verge of acquiring military nuclear capability, the Fars News Agency reported. “These remarks are at odds with reality,” Iranian Foreign Minister Manouchehr Mottaki said during a press conference at the Iranian embassy in Madrid, stressing that Tehran has always sought only peaceful uses for nuclear technology.’ 24 During the preparation of the Iraq war, Russia was very skeptical of the explanations offered by the Bush regime, including at the UN Security Council. This time around, it would appear that parts at least of the Russian government are lending credibility to the US charges. At the same time, Russia continued to assist Iran in the construction of the Bushehr nuclear power reactor, which should come on line and start generating electricity within a few months. The Iranians also operate research reactors. On July 12, Iran announced that ‘nuclear fuel for the Tehran research reactor will be ready in September 2011…. “God willing, we will deliver the fuel to the Tehran reactor next September,” Ali Akbar Salehi of the Atomic Energy Organization of Iran (AEOI) was quoted by Fars News Agency (FNA) as saying. “At present we have produced about 20 kg of 20%-enriched uranium and we are now producing fuel plates,” he said.’ 31 The Anglo-Americans have tried to make this 20% enrichment a virtual casus belli, despite the fact that weaponization requires far higher percentages, well above 90%. According to Vernochet of the Réseau Voltaire, the Russian policy ‘appears to reflect a certain schizophrenia at the highest level of the state, or an openly diverging policy with two heads, with a presidency a priori more pro-Western than Prime Minister Vladimir Putin.’ 32 McDermott agrees about this latent conflict, noting: ‘There is also the thorny issue that Prime Minister Vladimir Putin, has a group of foreign policy aides managed by Yuriy Ushakov functioning as a “little” foreign ministry: which represents the single greatest barrier to adopting such policy concepts (Ezhednevny Zhurnal, May 14).’ The net result of these developments is that the aggressive forces inside the United States think they have a much freer hand with Iran than they did during the time of the Putin presidency. As already noted, the Brzezinski-Nye-Trilateral faction is losing ground to the neocons, who have been mightily strengthened by the ascendancy of their chosen factional figurehead and presidential candidate for 2012, General David Petraeus. The planned color revolution in Iran has not materialized, and therefore the neocon recipes for aggression are winning by default, especially given the systemic hysteria induced by the financial breakdown crisis. The Brzezinski-Nye-Trilateral group had been early supporters of Obama, and growing public awareness of Obama’s weakness, fecklessness, dithering, and treachery are also weakening his backers. During the declining years of the Bush regime, one of the most important signals of a general ruling class consensus that the US attack on Iran should be taken off the table was the national intelligence estimate issued in December 2007, which concluded that Iran no longer had a functioning nuclear weapons program. This simply meant in practice that the neocons, for the moment, were out of power. This finding was opposed tooth and nail by the neocons, and was directly contradicted by the claims of Israeli intelligence. The way in which this new NIE is being rigged, with the facts and intelligence being fixed around the desired war policy, is reflected in a recent rare interview by CIA Director Leon Panetta. The new phony NIE is now guaranteed to repudiate the previous finding, and to accuse Iran of actively seeking nuclear bombs. This was in fact Panetta’s first network news interview since taking over the CIA in early 2009. According to one published account, ‘in an ABC News interview Sunday, CIA Director Leon Panetta alluded to a fact that was reported by Newsweek months ago: U.S. intelligence agencies have revised their widely disputed 2007 conclusion that Iran had given up its efforts to design or build a nuclear bomb. That shift is expected to be reflected in an update of the controversial 2007 National Intelligence Estimate, which was supposed to have been completed months ago, but according to three counter-proliferation officials, who asked for anonymity when discussing sensitive information, the formal update still is not finished and may be delayed for months to come. Even when it’s done, officials have said, the Obama administration is expected to keep the revised report’s contents officially secret….’ 34 Panetta, a political hack, has claimed that Iran is working on weaponization of fissile material, which has been a central issue in the dispute within the US intelligence community. With this, Panetta clearly joins the warmonger camp. The mendacious process by which National Intelligence Estimates are manufactured on sensitive issues like Iran is much illuminated by the case of the Iranian scientist Shahram Amiri. Amiri, it will be recalled, issued a Youtube video in which he alleged that he had been kidnapped by the United States while on a pilgrimage to Saudi Arabia, and was being held in Arizona. Later, he issued another videotape, this one better produced, in which he reassured the public that he was fine, studying physics in Arizona of his own free will. A third tape went back to asserting that he had been kidnapped. Amiri at length appealed to the Iranian interest section of the Pakistani Embassy in Washington, DC, and soon returned to Iran. Amiri, The CIA’s New Iranian Curveball? So what is the truth about Amiri? We need to recall the examples of the anonymous “source Curveball” and of Achmed Chalabi, two Iraqi adventurers assiduously courted by the neocons and plied with large sums of US taxpayer money in order to make fantastic allegations about the allegedly threatening programs of weapons of mass destruction being pursued by Saddam Hussein. If the CIA had really brought Amiri to the United States and offered him $5 million, it is a pretty good guess that he was being paid to provide the lurid details of an Iranian nuclear weapons program which many qualified experts, as we have just seen, conclude to be nonexistent, just as the US government officially stated in December 2007. Now that Amiri has fled back to Iran, another possibility opens up for the US mindbenders: they might now argue that the December 2007 NIE which concluded there was no Iranian nuclear weapons program had been based on falsified information procured by Amiri and others like him, who had been recruited to espionage by the US, but who later proved unreliable – as shown by Amiri’s flight back to Iran to rejoin his family there. All of these points represent good reasons not to believe the contents of the new NIE when its contents are reported in the press in the very near future. It is guaranteed to be a tissue of lies. The last word from Amiri seems to be a statement that there is no Iranian nuclear weapons program after all. This has been established by CIA veteran Philip Giraldi based on leaks from his networks inside the agency. As Gareth Porter of IPS reported, ‘Contrary to a news media narrative that Iranian scientist Shahram Amiri has provided intelligence on covert Iranian nuclear weapons work, CIA sources familiar with the Amiri case say he told his CIA handlers that there is no such Iranian nuclear weapons programme, according to a former CIA officer. Philip Giraldi, a former CIA counterterrorism official, told IPS that his sources are CIA officials with direct knowledge of the entire Amiri operation.’ 41 But mere facts have never prevented the neocon mythographs from pressing for aggression. Maybe they will now re-create the Pentagon’s Office of Special Plans, which was responsible for a series of whoppers in 2002-2003. Defense Secretary Robert Gates is taking special pains to argue against the idea that Iran could be held in check by traditional nuclear deterrence of the time-honored Cold War type, even if Tehran were to procure nuclear weapons. This is an argument which has been endorsed by some leading US military officers, who are obviously not eager to go into the Iranian meatgrinder. According to Fox News, ‘Gates is sounding more belligerent these days. “I don’t think we’re prepared to even talk about containing a nuclear Iran,” he told Fox News on June 20. “We do not accept the idea of Iran having nuclear weapons.” He added: “I don’t think we’re prepared to even talk about containing a nuclear Iran. I think we’re — we — our view still is we do not accept the idea of Iran having nuclear weapons. And our policies and our efforts are all aimed at preventing that from happening.” … “Actually, what we’ve seen is a change in the nature of the regime in Tehran over the past 18 months or so. You have — you have a much narrower based government in Tehran now. Many of the religious figures are being set aside. As Secretary Clinton has said, they appear to be moving more in the direction of a military dictatorship. Khamenei is leaning on a smaller and smaller group of advisors.”’ 43 Gates had been skeptical in public about the Iran attack, in conformity with his Brzezinski pedigree; his joining the extreme war party thus means the bureaucratic situation is deteriorating. The US argument against the Iranian regime used to be that Iran was bad because it was a theocratic dictatorship of the mullahs, who were the bearers of Islamic fundamentalism. Gates and Clinton now argue that Iran is bad precisely because it is no longer a theocratic dictatorship of mullahs, but an authoritarian military dictatorship. The only constant is the desire for war and confrontation. In order for the US to assemble an Arab-Sunni front in the Middle East to oppose the chosen Persian-Shiite adversary, it was considered advantageous to get the Israelis to make a few concessions to the Palestinians with a view to creating the illusion of progress towards an overall peace settlement between these two parties. Because the politics of economic depression has produced a marked heightening of the extremist elements of Israeli politics, the Netanyahu regime has refused to make any concessions, and has acted out defiance of Obama for domestic political consumption. This dynamic gave rise to the hostile and heated atmosphere of Netanyahu’s previous White House visit. This time, the atmospherics were kept more conciliatory. In any case, Netanyahu’s demand for US military attack on Iran is a constant refrain. Many reports stress that the political leadership of Saudi Arabia and the United Arab Emirates are issuing strident demands that the US make the attack on Iran, thus abandoning all hypocritical pretenses of Arab solidarity. One piece of evidence in this regard is the outburst of the UAE ambassador to the United States during a panel discussion in Aspen Colorado during the first week of July. In response to a question about Iran, UAE ambassador to the United States Yousef Al Otaiba issued a remarkable open call for US military aggression in regard to Iran, despite the likely serious negative side effects which his own country would experience because of its close geographical propinquity does a theater of war. ‘”I think it’s a cost-benefit analysis,” Mr. al-Otaiba said. “I think despite the large amount of trade we do with Iran, which is close to $12 billion … there will be consequences, there will be a backlash and there will be problems with people protesting and rioting and very unhappy that there is an outside force attacking a Muslim country; that is going to happen no matter what.”’ Al-Otaiba concluded: ‘”If you are asking me, ‘Am I willing to live with that versus living with a nuclear Iran?,’ my answer is still the same: ‘We cannot live with a nuclear Iran.’ I am willing to absorb what takes place at the expense of the security of the U.A.E.”’ 46 Al-Otaiba was soon called home for consultations. His formulation is reminiscent of French President Sarkozy’s cynical comment that the only thing worse than bombing Iran is Iran with a bomb. According to Joe Klein of Time Magazine, the demand for war by the Saudis and the Gulf states is pushing the United States rapidly down the path to military conflict. One senses that alibis are being prefabricated for Obama and his officials for when the body bags begin to come home. Klein writes: ‘One other factor has brought the military option to a low boil: Iran’s Sunni neighbors really want the U.S. to do it. When United Arab Emirates Ambassador Yousef al-Otaiba said on July 6 that he favored a military strike against Iran despite the economic and military consequences to his country, he was reflecting an increasingly adamant attitude in the region. Senior American officials who travel to the Gulf frequently say the Saudis, in particular, raise the issue with surprising ardor. Everyone from the Turks to the Egyptians to the Jordanians are threatening to go nuclear if Iran does. That is seen as a real problem in the most volatile region in the world: What happens, for example, if Saudi Arabia gets a bomb, and the deathless monarchy there is overthrown by Islamist radicals?’ 47 We should stress that the rulers of Saudi Arabia and the Gulf states represent some of the most extreme and backward feudal relics to be found anywhere on this planet, having survived through the 20th century mainly thanks to the fact that these were British imperial puppet states for most of that time. The idea that a gaggle of titled feudal reactionaries can talk the United States into a catastrophic war shows how far gone the current situation actually is. One who rejoiced that the UAE was now ready to fight the Iranians to the last American was the notorious philodoxer Bernard-Henri Lévy, who had already done yeoman service for the Anglo-Americans over many years as an all-purpose warmonger on the subject of Iraq. Here is part of the Huffington Post account of Lévy’s remarks: ‘”The UAE has chosen to side with the camp of those who apply to the letter the new United Nations resolution of June 9,” wrote Lévy, noting that it was “truly a blow to the regime” in Iran. For Lévy, the “union sacrée” of Muslim countries against the “Zionist enemy” is a fantasy. The countries that feel threatened by Tehran, he added, now have the opportunity to form an alliance of convenience. We might as well say that the Emirates’ decision is truly a blow to the regime…. And the fact that, for the first time, an Arab country took this step, the fact that it said no to the Iranians’ attempted holdup, thus foiling the manœuvre of which Hamas and Hezbollah were the vanguard but whose ultimate goal was to set the region ablaze, constitutes not only a gesture of survival but proof of maturity and a welcome sign of clarification. If this decision is maintained, nothing will ever be the same again. And for Ahmadinejad, the countdown will have begun.’ 49 The reference to the countdown at the end suggests Lévy’s vision of US missiles streaking towards Tehran with their deadly cargo.